Yellow starthistle Centaurea solstitialis, copyright Franco Folini. 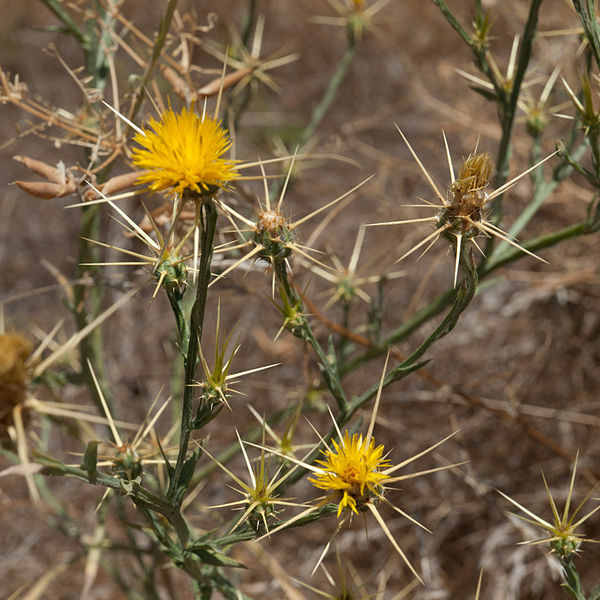 The first thing that struck me when I was looking up material on Centaurea was how evocative some of the vernacular names associated with this genus are: starthistle, blessed thistle, dusty miller, sweet sultan. Centaurea, the starthistles and knapweeds, is a genus of composite-flowered plants native to Eurasia and northern Africa, with the highest diversity of species in the Mediterranean region. A handful of species have been spread to other parts of the world in association with humans; a handful of these are significant pasture pests such as spotted knapweed C. maculosa and yellow starthistle C. solstitialis, whereas others such as dusty miller C. cineraria are grown as garden plants. Centaurea is a large genus: depending on how you count them, it may contain anywhere between 300 and 700 species. The greater number of species are perennial herbs, but the genus varies from small spiny shrubs to low spreading annuals (Wagenitz 1986). Some arise from a single central tap-root; others grow from spreading rhizomes. 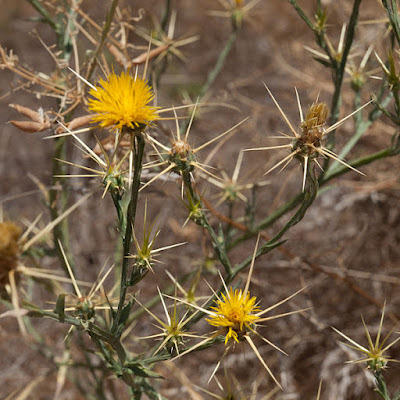 Some species have spiny leaves and conform to our general idea of a 'thistle'; others do not. The leaves are often deeply divided at the base of the plant, becoming entire towards the top. Flowerheads may be borne singly or in a corymbiform arrangement (a flat-topped cluster); the phyllaries (the bracts surrounding the flowerhead) often extend outwards around the head, and may be themselves tipped with spines. Squarrose knapweed Centaurea triumfettii, copyright Kristian Peters. With a genus of this size, it should be hardly surprising that taxonomic complications are involved. Long recognised as morphologically diverse, it has been confirmed as polyphyletic by more recent molecular analyses (Garcia-Jacas et al. 2001). The majority of Centaurea species fall within a single derived clade within the composite subtribe Centaureinae, united both by molecular data and by a number of morphological synapomorphies including adaptations for myrmecochory, dispersal of the seeds by ants (the seeds carry an attached oily body called an elaiosome; ants carry the seeds back to their nest where they may eat the elaiosome but leave the seed to sprout). A handful of species, though, lack these synapomorphies and lie in scattered segregate clades among the remainder of the Centaureinae. Some of these segregate clades, such as the former section Psephellus, have been straightforwardly promoted to the status of separate genera. One small segregate clade, however, is a little more problematic because it happens to include the north African Centaurea centaurium, the original type species of the genus Centaurea. Under normal circumstances, then (other than lumping the entirety of centaureines in a single genus), the name Centaurea would apply only to this small clade (including only about a dozen species) while the hundreds of species in the main 'Centaurea' clade would have to be renamed. In this case, the name with priority for this large clade would be Cnicus, generally used to date for only a single species, the blessed thistle Cnicus benedictus (no, I haven't been able to establish why it is called the 'blessed thistle'; I have found references to a tradition of medicinal use for this species, including its supposedly encouraging milk production in nursing mothers, but I haven't been able to confirm if this is the reason for the name). In order to stave off this nomenclatural turmoil, it has been proposed that the official type species of Centaurea be changed to a member of the main clade (Greuter et al. 2001), so this clade keeps the name Centaurea (and the blessed thistle becomes referred to as Centaurea benedicta) whereas the small clade including the prior type species becomes known as the genus Rhaponticoides. I haven't found whether a final decision has been made on this proposal (the process for such nomenclatural decisions is a bit more involved for plants than animals, requiring an open vote at an international botanical conference rather than just being decided on directly by a select committee) but it seems to have general support. 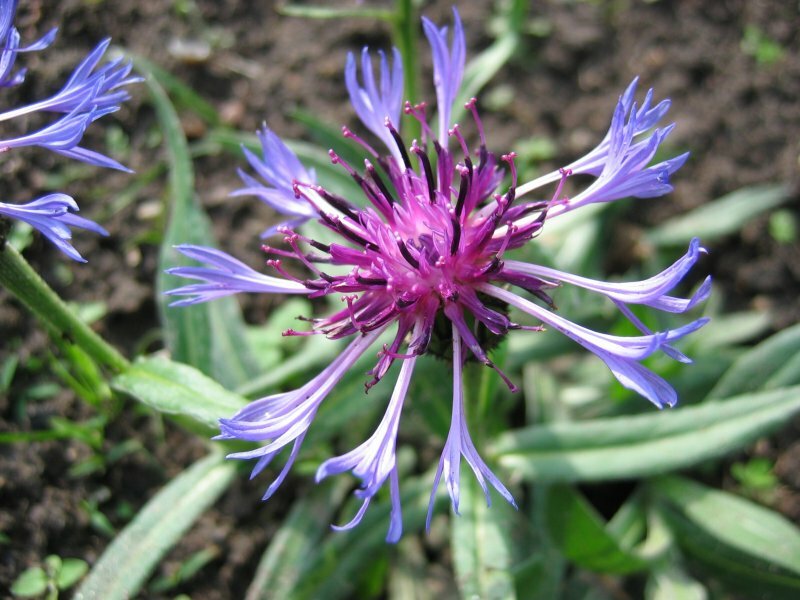 Less certain is the status of the cornflowers of the section Cyanus, which some have proposed recognising as a separate genus but which is closely related to the main clade, making the case for its separation a bit less compelling. Garcia-Jacas, N., A. Susanna, T. Garnatje & R. Vilatersana. 2001. Generic delimitation and phylogeny of the subtribe Centaureinae (Asteraceae): a combined nuclear and chloroplast DNA analysis. Annals of Botany 87: 503–515. Greuter, W., G. Wagenitz, M. Agababian & F. H. Hellwig. 2001. (1509) Proposal to conserve the name Centaurea (Compositae) with a conserved type. Taxon 50: 1201–1205. Wagenitz, G. 1986. Centaurea in south-west Asia: patterns of distribution and diversity. Proceedings of the Royal Society of Edinburgh, Section B, Biological Sciences 89: 11–21. I enjoyed this post. In the American West we generally despise Centaurea, mainly because of the very problematic C. maculata. So it's nice to learn about other species. Blessed thistle was credited with curing all sorts of diseases from plague (it is mentioned in most works about the plague) and malaria to migraines, poisoning and poor appetite. Some sources say this is the reason for its name. However, Hieronymus Bock (1498 - 1554) wrote that the plant was introduced to Europe from "India" as a gift to the Holy Roman Emperor Frederick III (1415 - 1493). Matthioli wrote in 1548 that the plant was known throughout Italy as a medicine but was only cultivated, not found wild and that it was called the Turkish herb. Also El Dioscorides Renovado by P. Font Quer, not available in English or online, as far as I know. Thanks very much for the info, Pat. The Ostrich: From Whence this Derpy Horror?